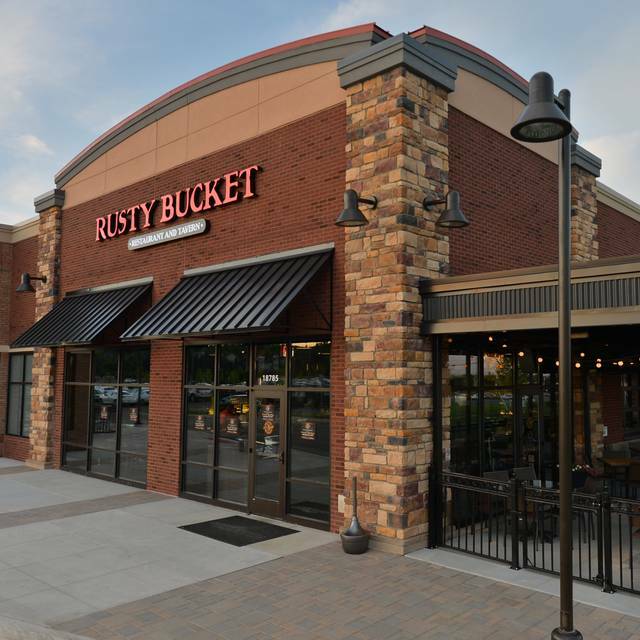 Rusty Bucket is a casual American restaurant and tavern, a gathering place where people come to share laughter, smiles, and great conversation over food that makes everyone happy. Satisfying and familiar, the menu is classic American fare, thoughtfully prepared from scratch by each location's Executive Chef. Cocktails are considered a craft, made-to-order by highly-skilled bartenders. From barrel to glass, no short cuts are taken with the carefully selected beer list. The perfect draft is guaranteed. Join us for lunch, grab a drink after work, bring the kids for dinner - we've got a seat for you! Great Food. Great Drinks. Great People. The Bucket Life. Easter Brunch was great ! Poor management. Server was not trained how to serve food at the table. Reached across the table and across people and handed food to customer. Food was average. I've been to other Rusty Bucket locations and had much better experience. Probably wont go back to this location. Server was outstanding. She split our order on two plates when she overheard that my sister and I wanted to share. A wow moment. Thank you! Lunch time with friends. Perfect. Waitperson, Chris was SUPERB. Rusty Bucket has always worked out as a good place to meet up with friends and family. Food is good. Service is good. The atmosphere and noise level allows for conversation. Anonymous, we would like to thank you in person but we do not who you are. Thank you for the 5 stars and the great review. My first experience was good, friendly and prompt service. However on my second visit the service was bad. Our order was taken in a timely manor but then it took nearly an hour for our dinners to arrive. Five meals, one was a salad, 3 meals were barely warm and one was okay. The Food was bland and tasteless and honestly felt it was a waste of money- upon stating that to waiter he just kinda blew it off . Will not return to another Rusty Bucket - name really does match the rusty tasting food. made advance reservations for six, was put in a corner of the bar area at a pub table. We needed to drag a bar stool over for additional seating. No service for at least twenty minutes. Raindancer, We appreciate the awesome review and the 5 star rating. Hope to see you soon! Terrible experience. Waiting over a half hour beyond the reservation time to be seated. We were told that they only had 9 chairs available for our reservation of 10. We were sat in the summertime patio which was covered in plastic (no windows). It was freezing in there. Overhead heat lamps were broken and fireplace wouldn't work. Food was terrible. One persons food was delivered after almost everyone else was finished - it was just a taco salad, so we have no idea why it took so long. My 7 yr old nephew waited for fries for over 20 minutes. The manager apologized but didn't offer to do anything. I only ate about 4 bites of my food as did my cousin - we were still charged for it. We complained politely to the waiter and manager yet nothing was done. Very disappointed. My aunt comes to visit once a year and it was our yearly family gathering - we rushed and got done as quickly as we could so we could leave. Horrible experience. Birthday. Had to remind server twice re: bday desserts. She never offered others dessert. She was pleasant enough but not at all attentive. Food was fine, usual bar food which is what we wanted. Good food - had the steak, plus the hummus. Bread pudding was the best we've had. Service was excellent. Food was good, service was good, wine was way over priced compared to similar restaurants. The food was very under stated the meatloaf was just a hamburger paddie, the salmon salad was very small and the shrimp scampi was very small and only a few pieces of shrimp. I brought my mother here for her 91st birthday. I liked that we sat by the fire and had a cozy heater above us. I also liked the fact that there were a few vegetarian options and that the food tasted good. The down side was that our waitress was not very attentive. My sister’s order was wrong. We had to get another waiter to find our waitress so that we could get boxes and the bill. Made a reservation for my mother in laws 60th birthday and when we showed up they put us out on the patio that was outdoor with tent like walls and overhead heating(It was 20 degrees outside). Asked to be moved and they moved us to a different table which was also on the patio. The inside wasn't busy at all. Also must have changed their menu since the last time I was there as the meatloaf left something to be desired. My waitress was the only thing that made the visit tolerable. We will not be going back. Great service, food was real good. Will come back. Service was good, but the food was not very warm. The manager came by and apologized and gave us a credit on the bill. Had reservations but would not let us sit on n the patio. Saw a few tables with people later as we were dining. Server had no personality. Food was okay. Very nice place to grab an outstanding burger, and the new Mac n Cheese absolutely delicious!!! Always good food! Good selection of beer and wine ! The wait staff was attentive and the food was tasty. I normally go to the Rusty Bucket in Southfield. However, opting to try a different location, and wanting brunch, I was the first to arrive. Once seated, the waitress did not greet me after 15 minutes of her going to her other tables. I waited, and once my sisters arrived, we sat another 15 minutes without the waitress ever saying a word to us. I had waited 30 minutes without a single word from the waitress! We spoke to the manager who was very nice and very apologetic. We still left and went to Granite City! It was THE BEST CHOICE EVER! WONDERFUL SERVICE AND AWESOME FOOD FOR $25 a person all you can eat! So, I guess a huge THANKS is in order to Rusty Bucket! If it wasn’t for the very tasteless and poor way we were treated, we never would have discovered the hidden gem of Granite City’s Brunch. Not sure where the break down was at the restaurant. I would have appreciated the fact that they would have told us the issues up front. Hate making reservations for a large party of 8-just to sit for an hour before the appetizers came out. We ordered spinach queso dip and it was loaded with SALT! Almost like they dumped the whole container on our batch it was gross. Our dinner finally came later and it wasn’t warm. We spent close to 3&1/2 hours. Food was really good and the service was good as well. It does get a little loud in the dining area but would definitely eat there again. The seared AHI Tuna wrap should be tried! We had come here because the restaurant boasted a gluten free option menu. Unfortunately we left disappointed. The food was dry and unsatisfying. The portion to price ratio was off in my opinion, and few of us left hungry. Our server was hard to track down on occasion and told us she left because she had an itchy throat. I wouldnt reccomend this restaurant to anyone. You're night would be more enjoyable elsewhere. Nice variety of food. The burgers were delicious! Good food and great service! Will return to the restaurant again! I brought my 11 year old daughter and 5 friends to celebrate her birthday after a pottery outing. We were able to get a reservation on a Sat evening with no trouble and our server was great. She was very friendly with the girls and attentive to our group. The food was delicious and the menu offered enough choices for the girls. The ambiance was nice; not so loud that they couldn’t hear each other. We will definitely be back! Graduation celebration. They did a lot to accommodate our large group. several guests were unimpressed with the food. the cost averaged $20 per person, including 2 kids, which is kinda pricey for bar food.